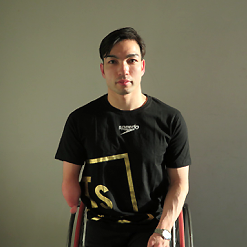 In 2009, Started working at the sports apparel and equipment company, GOLDWIN INC.
Takayuki Suzuki started swimming at the age of six and competing when he was 15. In 2004, during his third year of high school, he participated for the first time in the Paralympic Games in Athens and won the silver medal in the 4x50m Medley Relay. In 2008 he served as the captain of the Japanese Para-Swimming Team at the Beijing Paralympic Games and won the gold medal in the 50m Breaststroke SB3 and the bronze medal in the 150m Individual Medley SM4. He also set the world record in a heat of the 50m Breaststroke. At the London Paralympic Games in 2012 he was the captain of the team and brought home two bronze medals in the 50m Breaststroke SB3 and 150m Individual Medley SM4. At the Rio Paralympic Games in 2016 he came fourth in the favourite evens. Off the field of play he served as an ambassador for the 2020 Tokyo Olympic and Paralympic invitation committee and submitted an invitation file to the IOC (International Olympic Committee) and the IPC (International Paralympic Committee) in 2013. He moved to Newcastle in the UK in 2013 and is currently studying Sport Management at Northumbria University as well as being an athlete.